Outside the station, the waning light of day struggled against the might of gray storm clouds, tinging the sky with the color of blood. The storm gathered strength and pushed in around the station: a tiger that circled its potential prey. Lightning reached out between the clouds as the storm tested its strength. Electricity flashed bright against the dark sky followed by the roar of thunder. Between the shake and rattle of the clouds, the Brass Griffin darted between the chaos. Aboard, Captain Anthony Hunter stood resolute on the quarterdeck, like a rock set against the waves. Beneath his feet, the vessel raced through the clouds. 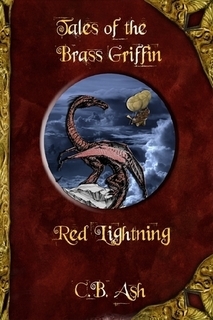 Gusts of wind tossed the Griffin about until the ship crested the larger thunderheads. Then the wind was joined by bursts of cold rain. Hunter stood, unmoved by the storm’s display, his frown a permanent carving etched in stone. 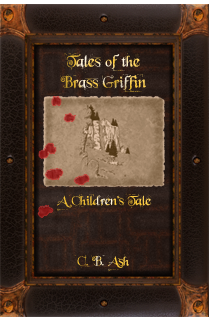 “Station, ho!” Came the shout from the crow’s nest, high above on the Griffin’s gas bag. “Steady as she goes, Mr. Tonks.” Hunter said automatically. Hunter listened more carefully a moment. Again the thunder rolled between the clouds like stones falling downhill. Behind that, however, he could hear something more. A set of low, regular rumblings, not dissimilar to thunder but more alike to other phenomena of which Captain Hunter was intimately familiar. “That’s because it’s not.” He replied just as the Griffin broke from the clutches of the thunderclouds and into the teeth of another type of storm. “Action Stations! All hands to action stations!” Hunter shouted. On the main deck, Lucas dropped the empty bucket he carried and raced off to grab the rope on the ship’s bell. He rang it furiously in the prescribed rhythm he was taught. Immediately the crew raced to their assigned posts while rifles were handed out. The moment the clouds broke, the station emerged full into view. 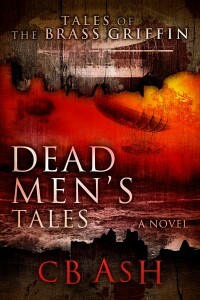 Along the dock, the distant crackle of gunfire echoed on the cold, damp air. Puffs of acrid smoke drifted in small clusters where the fighting was fiercest. A group of fifteen men were barricaded in the wreck of the La Paloma, arranged in a rough firing line along the ruined vessel’s side. Because of how the La Paloma was tilted to one side, it only provided cover from anyone that might approach from the station. Any arriving ship could easily see the men. Occasionally they rose from cover to fire towards the station, where an unruly mob of twenty figures slowly ambled in a swarm from the buildings. Most did not carry weapons, and those that did held onto the odd pipe or hatchet. Despite the lack of firearms or other equipment, the staccato bursts of gunfire did not seem to bother anyone in the unruly mob. Each time any were hit, they would fall, only to stand up and resume their unnerving, silent march. The figures on the La Paloma, however, were anything but quiet. Even at a distance, the shouts of orders could be heard. In between La Paloma’s defenders and the encroaching figures from the station, the lone dockmaster’s shed stood exactly in the middle. From the open doorway and the broken window, a handful of figures could be seen, rifles at the ready. Then, for only a moment, the air went deathly still. It was as if the storm itself waited in breathless anticipation for something traumatic to happen. Suddenly, the dock was enveloped in a wide blossom of flame and rapidly surrounded by a billowing cloak of black, oily smoke. The smoke boiled out in all directions obscuring any view of the dock. The roar of the explosion rolled out like a wave, then hammered the Griffin and her crew with its passage. After a moment, the smoke parted in time to see the final five feet of the abused, burnt and broken dock surrender to the inevitable and fall away into the waiting storm clouds below. A mere hundred yards closer to the station, the dockmaster’s shed remained standing, resolute against the firestorm. Hunter tore his eyes away from his besieged people on the dock to look in the direction Tonks indicated. 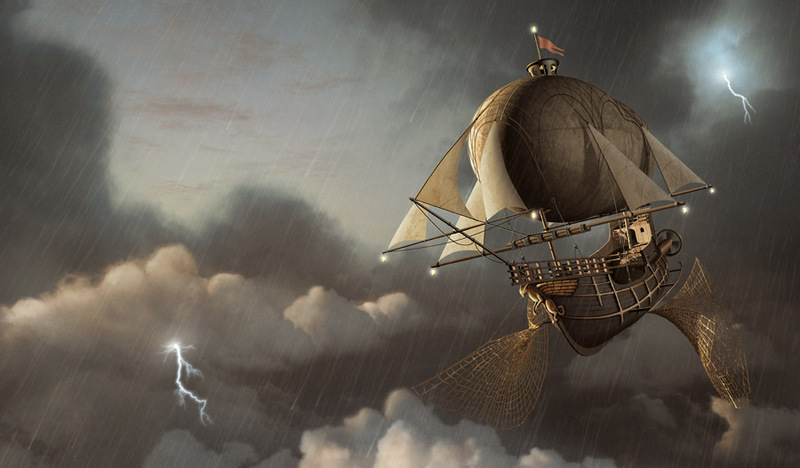 Two air ships were locked in a violent duel. One, a schooner only a few feet longer than the Brass Griffin, had just completed a turn, passing three hundred yards from the wreck of the La Paloma. A copper-lined hull covered her keel, and her gas bags were not the usual elliptical tube Hunter was accustomed to. They were longer, though not as large in circumference. At her waterline, a set of metal pontoons was attached to the ship’s hull. The ship had taken a hard pounding. That much was obvious to Hunter even before he pulled out his spyglass. Three ragged tears in her hull vomited a foul, black smoke. Her crew raced along deck, some to tend to repairs, others to defense, and the last to the wounded and dead. The crew’s uniforms were unusual, at best. All wore brown trousers, ankle-high sandals in a stout leather, thigh-length tunics and a wide leather band that covered the waist and mid-section of each sailor. Three belts kept it secure. Hunter squinted to make out another figure aboard who wore a similar style of clothing, but boasted a leather jerkin with an insignia upon it. It was at that moment the observed ship shuddered from another artillery impact, and smoke blocked Captain Hunter’s view. He blinked in surprise, swinging the spyglass around in search of the cause. His keen eye found the second ship in moments. This was a style of ship Hunter was familiar with. An armored frigate with sails stained so deep with soot and smoke they were black, a gray gas bag and a full compliment of forty-four guns soared five hundred yards off from the wounded schooner. Its crew scrambled to reload the cannon. Neither ship flew any flags of nationality or had any markings on their hull. The captain could not put his finger on the reason, but something about that ship seemed all too familiar. “Who are they, Cap’n?” Tonks asked. “I’m not certain, Mr. Tonks. Neither are flying a flag.” Hunter turned his glass back towards the wounded vessel. “We’ve just left the cloud bank, so we’ve only a few moments’ peace before they spot us. Bring the Griffin about, we’ll … ” the captain’s words words caught in his throat. There, on the schooner, a banner hung from the base of the quarterdeck. Stung by flame and darkened by smoke, the stretched cloth retained still legible markings in what appeared to be Latin. The most striking feature was the golden relief of an eagle with its wing outstretched. At first Hunter mistook it for the American eagle, then he realized the eagle sat on a perch and held neither olive branch, nor cluster of arrows. “Cap’n, we’ll be blind through there ’till we reach the docks.” Tonks said tersely. Beneath Hunter’s feet, the Griffin turned and pitched downward in response to the pilot’s skill. The captain turned his spyglass back toward the frigate just as she released another volley at the schooner. Smoke rose from the artillery and circled the airship like a dark halo. Amidst the smoke, a familiar figure emerged on deck: a tall man, wrapped in a leather long coat, fine shirt and clothes. His hair was longer than Hunter remembered, though the thin narrow face was unmistakable. As if warned by some mysterious sixth sense, RiBeld paused in mid-stride across his deck. The aristocrat-mercenary turned slowly, his gaze rising to meet Hunter’s. RiBeld’s eyes went wide with astonishment, then hard with rage. Suddenly, as if guided by an unseen awareness, he glanced with a frown at the station’s dock in the distance. A thin-lipped sneer ripe with smug self-satisfaction, in which only an evil mind can languish, spread over his face. He laughed at Hunter. Captain Hunter could not hear the vile sound, but remembered the insane lilt of it from when last they met. RiBeld shouted an order to his crew over his shoulder, almost casually, as if he dared Hunter to interfere. Given the distance between them, Hunter could not hear the order given, but still his blood chilled with the implications. Artillery blazed, bright and hot from RiBeld’s ship. A moment later, the cluster of explosive cannon fire crashed into the station’s dock, washing it in flames. The dock, along with its scattered figures, the dockmaster’s shed, even part of the La Paloma were lost among the flames. Smoked billowed up and seemed to grin with the merciless humor of a skull. “No!” Tonks shouted in alarm. This entry was posted on Sunday, December 6th, 2009 at 11:30 pm	and is filed under Dead Air. You can follow any responses to this entry through the RSS 2.0 feed. You can leave a response, or trackback from your own site.